Why were the bombs dropped? Why were they dropped on the particular dates, 6 and 9 August? Why were they dropped on the particular targets, Hiroshima and Nagasaki? How far were the British consulted on 1? How far were the British consulted on 2 and 3? Although it is not possible to answer them in detail in a short blog, these questions make a good framework in which to examine the context of dropping of ‘Little Boy’ on Hiroshima on 6 August and ‘Fat Boy’ on Nagasaki on 9 August, the first ever use of atomic weapons that killed more than 200,000 people, devastated large areas and brought about Japanese surrender and the end of the Second World War. The short answer is that they were available. Once an atomic bomb had been produced and tested successfully, there was little doubt that it would be used. As Henry Stimson, US Secretary of State for War, wrote: ‘it was our common objective, throughout the war, to be the first to produce an atomic weapon and use it’2. Huge amounts had been spent on the Manhattan Project. Congress would want to see value for money. The ending of a devastating global conflict by conclusive force might deter future aggression, as well as demonstrating US dominance. Once it became clear in the spring of 1945 that an atomic weapon was likely to be ready in the summer, American plans included a probable operational date during August. On 2 July Stimson briefed President Truman, who had taken over on Roosevelt’s death in April 1945, advising a carefully timed Allied warning to Japan of the ‘varied and overwhelming character of the force we are about to bring upon the islands’ and the ‘inevitability and completeness’ of the destruction that would follow if Japan did not surrender.4 A proclamation was issued on 26 July 1945 calling on Japan to surrender. Though the Japanese Supreme War Council sought Russian mediation, this was rejected by Stalin and there was no sign that the Japanese leaders were ready to agree to surrender unconditionally. After the successful test at Alamogordo in New Mexico on 16 July (the day before the Allied conference opened at Potsdam) a more specific date for the use of the weapon could be set. Two bombs were ready: delay in their use might complicate the situation. An opposed US land invasion of Japan would undoubtedly cost many American lives: a Soviet invasion of Japan, proposed for 8 August, might have unwelcome political consequences. The specific dates were chosen for technical reasons (including the weather) and military ones. But political factors were also important. If this terrible new weapon were to be used, it must have maximum impact to bring about the desired result. The Interim Committee set up by the Americans to consider the political implications of the use of the bomb had recommended on 1 June that it should be used on a dual target: a military installation surrounded by or adjacent to houses and other buildings most susceptible to damage. It must be remembered that although the bomb was tested successfully on 16 July, the scientists were not sure how it would work in different atmospheric conditions or on different types of terrain. Nothing would be more damaging to the object of forcing surrender than a warning or demonstration followed by weapons failure. It had to work. 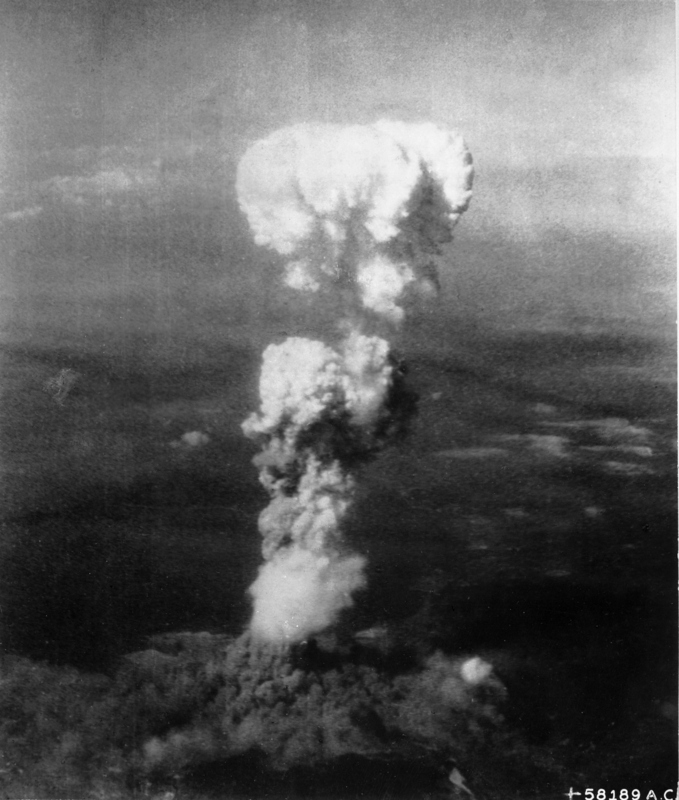 The Target committee had chosen Hiroshima, after much discussion, as a city that had not been affected by the US Air Force’s offensives, so that the damage would clearly be attributable to the new weapon and therefore create the strongest impression to the Japanese government of the destruction it could wreak. The bomb dropped on Nagasaki on 9 August had been intended for Kokura, but was diverted to Nagasaki when heavy cloud obscured the intended target. Though the Nagasaki bomb was bigger, its destructive effects were reduced by the terrain. How far were the British consulted on 1, 2 and 3? The British did not intend to oppose the decision. Under the Quebec Agreement of 1943 and the Hyde Park memorandum of September 1944 the bomb was not to be used without British consent. Churchill, confident in the closeness of Anglo-American relations, agreed in principle in early July 1945 to the operational use of the atom bomb. He discussed it with Truman at Potsdam, and after the shock Labour victory in the general election later that month the new Prime Minister, Clement Attlee, took Churchill’s place at Potsdam and was content to issue a statement on the use and development of atomic weapons drafted by his predecessor. Britain had fought a long, exhausting and ruinous global war: an early end to the Far Eastern conflict was what the Labour Government wanted just as much as its predecessor.7 In detailed planning for the dropping of the bombs, the Americans took the decisions, and the British did not know all the details. But they agreed on the need to use the weapon. John Ehrman’s 1953 account was naturally reticent on the subject of intelligence, but it was an important element in the context of dropping the bombs. Allied intelligence, from both Signals Intelligence (SIGINT) and other sources, indicated that the Japanese were unlikely to surrender as a result of an invasion of the islands by the US or of Manchuria and other territory by the Russians. It also contained warnings of the scale and ambition of Soviet plans in postwar Europe. Nevertheless, the Soviet Union had made a major contribution to Allied victory and Stalin was very much one of the ‘Big Three’. There were strong arguments for telling the Russians about the bomb.